4S RANCH — Probationary firefighter John Daniels watched as the flames swelled in front of him and smoke funneled throughout the structure he was in. Luckily, there was no hurry to put the flames out. What Daniels and the other firefighters inside wanted to do was keep the fire going in order to observe what happened to the flames and smoke as the structure’s ventilation outlets were manipulated. It was the first of several live fire training exercises scheduled for that day at the Rancho Santa Fe Fire Protection District’s fire training facility. Built in 2004 at RSFFPD’s Fire Station No. 2, the facility is now serving to train firefighters in emerging, new tactics on how to fight fires in modern structures. Being driven now more by fire science than traditional fire suppression approaches, the new tactics are aimed at firefighters being better able to understand fire and how to control it. Daniel Madrzykowski is the project leader for the ongoing Enhanced Effectiveness of Fire Fighting Tactics Project being done through NIST (National Institute of Standards and Technology) an agency of the U.S. Department of Commerce. The shift in tactical fire suppression stems from the examinations of structure fires from the 1970s to the present day. Since the ‘70s, Madrzykowski explained that the number of structure fires has decreased by 50 percent. The number of civilians killed in structure fires in the U.S. also decreased by more than 50 percent, and civilian injuries have gone down significantly, too. He tempered that by saying the number is still fairly small, though it’s not following the other trends in regards to fires. And so the question becomes, why not? During the ‘70s, researchers began looking into how to better understand fires. That included learning what toxic gases were being produced and the rates at which flames spread; some of that due to changes in the materials that make up people’s homes. “If a firefighter responded to a fire in the 1960s, 1970s, there was a good chance that the single pane window would have broken before they got there. The heat from the fire would have broken it,” Madrzykowski said. That would have allowed the firefighters to see where the fire was, that it was vented and then they could plan their appropriate attack. When the fire department shows up today, he added, they’re going to find nothing but smoke, because the fire is ventilation limited. If the firefighters use tactics from the 1970s, breaking all the windows and opening up the building to remove the heat, because of the synthetic materials that make up most of the products in the structures today, when it receives more oxygen, the fire gets bigger. “So, that’s where there’s a big disconnect between tactics from the days of old and modern tactics for modern structures with synthetic materials in them,” Madrzykowski said. The project’s endpoint is to change the NFPA’s (National Fire Protection Association) standards that dictate how firefighters are trained. They’re hoping to have all of the project’s information in place by 2016, Madrzykowski said. After the exercise was over, Daniels said it was interesting to see how, by simply opening the doors, the fire was affected. “That’s what we want to do is expose them to the fire behavior, get them used to that,” Battalion Chief Bret Davidson said. “The more we expose ourselves to those environments, the less likely guys are going to be nervous, and the more we can focus them on reading the characteristics of (the fire), versus just seeing the fire — and actually reading where the air is coming in and out,” he said. 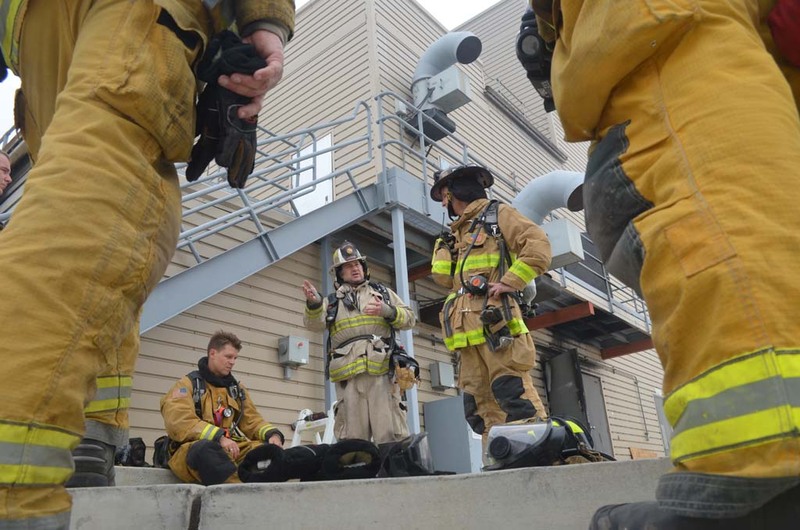 Live fire training exercises take place anywhere from 30 to 40 times a year, Davidson said, though the facility gets used a lot not only by the RSFFPD but by other local fire departments, including San Diego’s. There’s also EMS/paramedic training and drills done on a monthly basis. In Rancho Santa Fe, fighting a house fire is very different than in most communities, Davidson explained. “You’re talking about 10,000 to 30,000 square foot houses, really long driveways with a bad water supply, terrible access,” he said. And often times, being able to walk around the homes in the Ranch, watching for fire behavior and location to better be able to direct where the units should go in isn’t always available. Though fire is just one of many things they’re called out to, Davidson added that one of the reasons they need to train so much is because fires don’t occur all that often. The RSFFPD responded to 93 structure fires during 2013, in both Rancho Santa Fe and the surrounding communities. National figures from the NFPA show there were 480,500 structure fires in 2012, resulting in 2,470 civilian deaths, 14,700 civilian injuries and doing $9.8 billion in property damage. That amounts to one home structure fire being reported every 85 seconds. Madrzykowski added that as more departments are starting to change their tactics, the anecdotal evidence coming in is showing the new approaches are gaining positive results.